The value of Ford stock remained steady during the February 4th, 2019 – February 8th, 2019 timeframe, closing the week at $8.39 per share, representing a decline of $0.33 per share than its opening value for the week of $8.72. 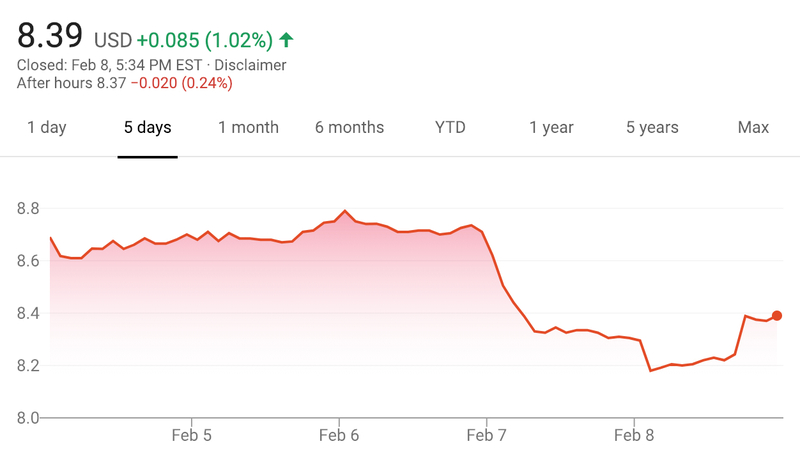 Overall, it wasn’t a particularly notable or exciting week for Ford shareholders, considering the decline in Ford stock value, however slight. By comparison, Fiat Chrysler Automobiles fell this week, dropping below the $15 threshold, while the value of GM stock grew for the fifth consecutive week. It will be interesting to see how Ford stock fairs in 2019 given the recent decisions by the automaker to optimize its business performance, including discontinuing all sedans and focusing on more profitable crossovers, SUVs and pickup trucks in the North American market, while at the same time beginning to invest heavily in significantly less profitable autonomous vehicles and technologies. Stay tuned to Ford Authority for ongoing Ford stock news and complete Ford news coverage. It seems that the stock market sees Ford’s folly. Too bad the geniuses at Ford don’t understand the market, and no longer understand they were a CAR company. It looks like they in the long run will be going the way of Isuzu and Mitsubishi which is irrelevant and inconsequential in the US.